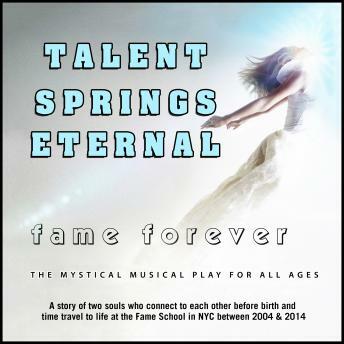 Talent Springs Eternal takes place in and around LaGuardia High School of Music & Art and Performing Arts in New York City, where alumni and friends are planning the twentieth reunion of the class of 1984. The "spirits" of Michael Peters (class of 1966) and Carmen Diaz (class of 1984) appear and observe what is happening at the school, which is in the middle of casting their senior production of West Side Story. After the celebration, "time flies," and listeners are transported ten years to the tenth reunion of the class of 2004 and the thirtieth reunion of the class of 1984, which are being celebrated at the same time. Inspired by Mildred Cram's romantic novella Forever, the classic musical West Side Story, Georges Bizet's popular opera Carmen, and Thornton Wilder's timeless play Our Town, this mystical musical play shows that even though life moves quickly, our creative spirit lives on.